Back in November last year HEXUS delivered the exclusive news that Raja Koduri, the then Radeon Technologies Boss, was leaving AMD. Later in the same month it emerged that Koduri already had a prestigious new role lined up; Senior Vice President, Core and Visual Computing Group, General Manager, Edge Computing Solutions, Chief Architect at Intel. Now, Motley Fool Analyst Ashraf Eassa has Tweeted (via NoteBookCheck) that Koduri has already had a considerable impact at Intel and is looking to redefine the Arctic Sound discrete GPU to be powerful enough for gaming. Earlier information regarding Intel's Arctic Sound GPU indicated that it was tailored for applications such as video streaming and data centre processing. However the analyst Tweet indicated that Intel has forked the project so there will be an Arctic Sound variant for PC gaming. Such a move could be a canny strategy for Intel as PC GPUs are in short supply, unavailable at anywhere near original RRPs, due to the cryptocurrency mining trend. Intel will "enter the market with a bang"
The last time Intel dipped its toe in the discrete GPU market was back in 1998 with the 350nm i740 using the AGP graphics interface. 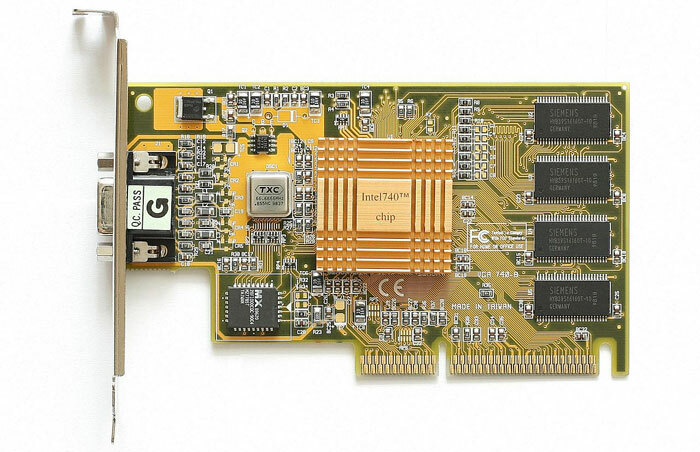 Koduri is said to want to "enter the market with a bang," with the Arctic Sound dGPU. However, according to the source we will have to wait for quite a number of months before Arctic Sound hits prime-time. A 2020 launch is on the cards for what will be Intel's 12th gen graphics architecture. 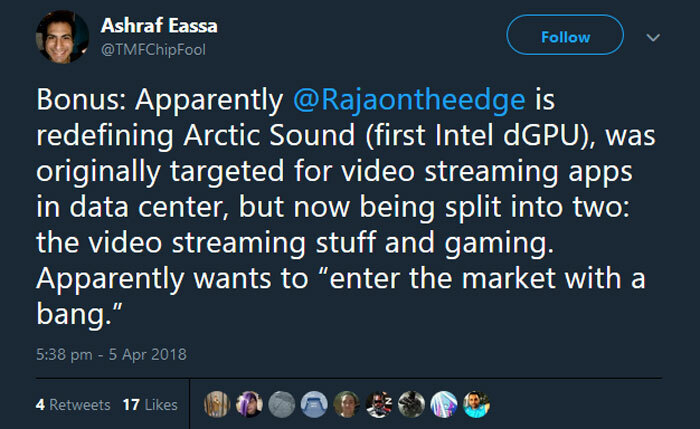 If things pan out it is likely that Intel will deploy Arctic Sound as not just an add-in-board, but also as a multi-chip-module, similar to the Core-G processors it recently released with AMD Radeon RX Vega graphics on board. Asus Nvidia GeForce GTX 1650 Ti graphics cards listed by EEC Nvidia teases GeForce GTX 16 series gaming laptops Intel Core i5-9400 PC Specialist Vortex S1 Has Samsung been chosen for Intel Xe GPU manufacturing? At least Intel is big enough to stick it to Nvidias GPP and promise partners whatever they need as they have their own fabs. The big question is whether Raja is using Intel IP for the dGPUs or is using his mental notes from AMD design methodology. Intel , but to be honest I don't care. We could really do with more competition in the high end graphics card markets if Intel aims for that. Paying £700 (now £1,000 due to mining) for a 1080ti which is already 2 year old tech is getting ridiculous and out of hand. AMD will be looking any hardware through a microscope to see if Intel has been naughty, when and if released! The thing is it isn't about what Intel can offer, because the only thing that matters is offering a commanding lead in the discrete GPU market. That is something only Nvidia can offer, and I don't see Intel upending that soon. OK, perhaps if they bundle a graphic chip with every motherboard chipset and ride out the lawsuit long enough to starve Nvidia of funds but that would take a while. I expect the real value is that he can look over the designs for current integrated GPUs and past failures like Larrabee and say “it didn't scale up because…” so they can fix their problems. AMD and Intel have an extensive patent cross licensing deal which almost certainly covers anything done here. Also, AMD has a technical lead in graphics and you don't stay at (well, near in this case) the front by looking over your shoulder at what the losers are up to.